The software was designed to be a user friendly and has interface, which is easy for navigation and understanding. If you don't know how to convert audio files you will not face any problems when using WMAConvert. The safety and quality of converted files are proved by our satisfied customers and previous successful editions. WMAConvert is available in three editions, you can choose one according to your needs. as the basic program edition allows you to convert any audio file to unprotected widely used MP3, M4A, WMA or WAV audio digital encoding formats. Using Platinum edition you can convert 2 files simultaneously with maximum speed conversion 6x. extended program edition will convert up to 16 files at the same moment up to 50x playback speed. In addition to Professional edition you will obtain free audio CD Ripper and CD Burner. program unlimited edition convert and unprotect audio and video files at extremely high speed to DRM-free formats (output audio formats: MP3, M4A, WMA & WAV; output video formats: MP4, WMV & AVI). Free additional bonuses: audio CD Ripper, CD Burner and YouTube Ripper. 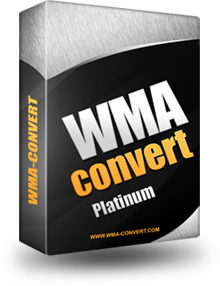 WMAConvert Platinum is best tool to convert any audio format. 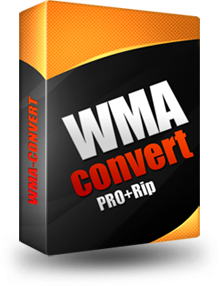 Free WMAConvert edition allows you to convert from MP3, WMA, OGG, WAV, FLAC and AAC, you can play your favorite music on PC, iPod, IPhone all MP3 players and more! You can convert audio file in any format to unprotected and popular MP3, M4A, WMA and WAV encoding formats. Platinum edition will help you if you need high-speed audio converting software. User friendly interface makes conversion process incredibly easy. 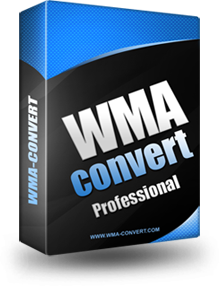 WMAConvert Professional will become your best software solution if you want to convert many files at the same time. You can convert any audio format to MP3, M4A (AAC), WAV or WMA in batch mode in few clicks. Professional edition allows you select a music folder an convert it to the desired format from WMA, MP3, OGG, WAV, and AAC and save it directly to the iPhone, iPod or selected device. Build-in free audio CD Ripper and CD Burner will rip audio on CDs. WMAConvert Pro+Rip is an unlimited edition of software. Using powerful Pro+Rip edition you will convert and unprotect video and audio on extremely high speed. Besides audio conversion this software edition can convert video in AVI, WMV and MP4 to unprotected video files. After converting video to the format you need, you can watch it on your PC, DVD, website or mobile devices. WMAConvert can extract audio from video file and save it in selected audio format. To rip your video on audio on CDs you will get free audio CD Ripper, CD Burner and YouTube Ripper. All listed WMAConvert software features will make the conversion process be the easiest thing ever even for amateur computer users and help you to discover all the beauty of music and video world. If the DRM license is valid and you can play the files on Windows player you would not face any problems converting audio files to unprotected format, which can be used wherever you need to. All what you need to start audio conversion is to download software and install trial version. Select the format for output files and mention the folder for files to be saved to. Regarding drag-and-drop function the controlling process was made more easier than in previous version. You can convert single file or all your media library. So, the WMA to unprotected MP3 conversion will be done in few mouse clicks.